In the aftermath of a car crash on the Tappan Zee that kills her mother, Jenna goes to live with her aunt. 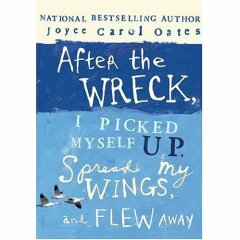 Haunted by survivor's guilt, she has a hard time adjusting to her post-wreck life. Instead, she becomes anti-social and withdrawn, experimenting with drugs and living an edgier life. The exception to her decline is her new found interest in a mysterious biker named Crow who seems to understand her in ways that no one else can manage. It's a good story, but seems a bit rough at spots (few of the story lines are resolved, characters come and go fairly breezily). It's also a bit long and drawn out. All of which suggests the need for more vigorous editing. That said, this is a good read and worth your time. Oates is a good storytellers with skill at characterization and understanding human behavior.